This article is about the level from Donkey Kong Country: Tropical Freeze. For the level from Yoshi's Woolly World, see Knitty-Knotty Windmill Hill. 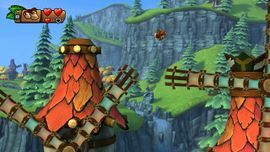 Windmill Hills is the first level of Autumn Heights, and the ninth overall in Donkey Kong Country: Tropical Freeze. It contains several rotating windmills that the characters must use as platforms. Windmill Hills starts out in a small glade containing several Cheesy Chesters and Hootzes, as well as a row of spinning windmills with spinning platforms. The player must use Dixie Kong's flying ability to get over the gaps and jump on larger enemies such as Pufftons, after which there is a Checkpoint. Following a Schnautzel, DK and Dixie will navigate more windmills, this time which spin faster than the ones before the checkpoint. After landing on a small patch of land where a Cheesy Chester randomly comes out, the Kongs will go through a series of Barrel Cannons, which take them across more windmills, between which are several Bananas, after which there is a similar windmill where they will receive Red Balloons if all the Bananas are collected. Soon after this, there is a Burlap Hanging Sack containing one of the level's Puzzle Pieces that must be opened by throwing the Diddy Kong barrel at it, which will switch Dixie out with him. Diddy's jetpack ability works similarly to Dixie's hair, still allowing the Kongs to fly short distances. Following that, DK and Diddy will enter a windmill and go up a stack of spinning gears, which have platforms that rotate rhythmically. There are also Pointy Tucks on the platforms, which cannot be jumped on. Upon getting to the top, the Kongs will go on a large platform attached to a long cord (acting as a slow zipline) which leads them to another area with a windmill containing bells that have to be rung (which ends up giving a Puzzle Piece), as well as the letter "N". Following this, DK and Diddy will go through another series of Barrel Cannons, this time flying through a wide area with fall-colored trees and more windmills with items, after which they land on a platform containing the Slot Machine Barrel that ends the level. K: Right above the flying Hootz's head below the second windmill, the jump to get it must be timed correctly. O: In front of the same gear where the first Puzzle Piece was. N: On a small platform above a gap, next to the windmill with the bells. G: In between two of the Barrel Cannons before the end of the level. The Kongs should defeat every enemy on this windmill and make the third Puzzle Piece appear. By breaking the wall behind where they first started out in the level with a barrel, the Kongs will go to a Bonus Stage, where, if all the bananas are collected within 30 seconds, they will receive the first Puzzle Piece. On the windmill right behind where the flying Hootz with the letter "K" is, more bananas will appear as the ones on the arms are collected, and after collecting all of them the second Puzzle Piece will appear. Appears after jumping on all of the Tucks on the arms of the windmill past where the Puffton is. After pounding next to the Wooden Canister near the Schnautzel, some bananas will appear and if all of them are collected the player will receive the Puzzle Piece. After the cannons, there is a large Burlap Hanging Sack containing the Puzzle Piece which can be opened by throwing the Diddy Kong barrel into it. This will switch Dixie out. After getting Diddy Kong, there will be a Item Handle in the ground which if pulled will reveal a hidden area where the Puzzle Piece is located. Just below where the first Barrel Cannon is above the gears, there will be a secret area to the left (marked by the small platform) where there are several bananas, all of which must be collected by getting shot through cannons, in 30 seconds or less to get the Puzzle Piece. After ringing all four bells on the parts of the windmill just before where the letter "N" is, the Puzzle Piece will appear from the center. In the last series of Barrel Cannons, the puzzle piece is above a windmill arm, and is collected by timing the cannon correctly when it goes past. German Gemühlrädert From Mühle german for Mill, and Gerädert which is a term used to describe the feeling of being worn out or tired. The segment where the Kongs travel through the interior of a giant windmill is an homage to the Clock Tower levels of the Castlevania series.